Looking ahead to the 21st century, Sustainable Tourism explains the current thinking process that underlies the emerging international principles of more sustainable development in travel and tourism. Using international illustrations it draws on experience and good practice as they are being increasingly applied around the world in the late 1990s. In sharp contrast to the problem analysis approach adopted by so many authors to this subject, this book is focused on the pro-active role the private sector industry can play in partnership with the public sector to achieve solutions through its day-to-day operations and marketing, expecially in product enhancement and quality controls. *Kruger National Park, South Africa *Quicksilver Connections, Barrier Reef, Australia *Edinburgh's Old Town, UK *Ironbridge Gorge Museum, UK *Rutland Water, UK. Industry illustrations are drawn from British Airways, Grecotel, Inter-Continental Hotels and Resorts, the International Federation of Tour Operators, P&O and TUI. Professor Victor Middleton has had some thirty years' international experience of marketing practice covering most of the private and public sectors of travel and tourism. He holds appointments as Visiting Professor at Oxford Brookes University and University of Central Lancashire. Dr Rebecca Hawkins runs her own business specialising in environmental aspects of tourism projects and has undertaken a number of pioneering programmes in this role. She was Deputy Director of the World Travel and Tourism Environment Research Centre at Oxford Brookes University, where she worked with Victor Middleton. "Sustainable Tourism deals with a subject which is of critical importance to the public and private sector practitioners in the tourism industry…This book cuts through the emotional rhetoric [of tourism sustainability] and explains simply how good environmental practice is excellent business both for the marketplace and for the destination. I feel privileged to recommend it." 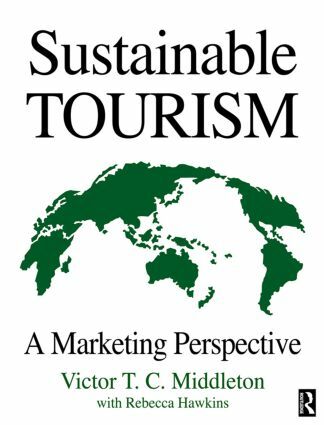 "The great value of this book is not only that it clearly demonstrates that [sustainable tourism] is a feasible goal through marketing, but that it also presents growing evidence of environmental best practice standards already being set by the industry. That in the process it also lays to rest some myths and misconceptions about tourism is an additional bonus for the reader." "I recommend this important new book to practitioners as well as students, and commend its authors for their contribution to a better understanding of environmental impacts and the new partnership delivery mechanisms that are needed." from the foreword by Robert Collier, Vice-Chairman, Saison Overseas Holdings B.V.
"I found Sustainable Tourism: A Marketing Perspective an impressive work. It is far superior to any other treatments of the issues and more practical too. Everyone talks about sustainable tourism development, but this is the first book to apply the power of marketing to achieve it. It shows, through principles, analyses and case studies, how tourism can grow while destinations maintain, and even regenerate, (the environments) required to support it." "This book is timely and to the point. Middleton and Hawkins clearly document the 'environment and development' characteristics of an industry generating more than 10% of global economic activity, as well as the emerging interest of the market in 'Green Tourism' which will bring a sharp new focus to public and private sector initiatives in this field. It's a valuable guide for anyone committed to sustainable growth." "The book is an insightful contribution to the topic of sustainability… the reader is provided with a readily accessible, rich source of cutting-edge information"
Foreword; Preface; The context, the issues, a global over-view - Environment, tourism: a marketing perspective; Global environmental issues; International summary of tourism and environment: Northern Europe, Mediterranean and North America; International summary of tourism and environment: East Asia & Pacific, Caribbean, Eastern Europe and Rest of the World; Travel and tourism: the world's largest industry; The environmental significance of holiday and leisure tourism; Managing tourism for sustainability at specific destinations - Managing tourism: the local destination focus; Managing tourism at local destinations: the public sector role; Managing tourism at local destinations: the private sector role; The marketing processes for sustainable tourism at destinations; The issues and cases of good management practice in the main sectors of travel and tourism - The 'R' word guide to corporate action on sustainability; Sustainability in the accommodation sector, with international illustrations; Sustainability in visitor attractions sector; Sustainability in the transport sector, with international illustrations; Sustainability in the tour operator sector, with international illustrations; International cases of good management practice for sustainability - Quicksilver Connections Ltd, Barrier Reef, Australia; Kruger National Park, South Africa; Edinburgh's Old Town, UK; Anglian Water Services, Rutland Water, UK; Ironbridge Gorge Museum, UK; Epilogue - Positive visions for sustainable tourism; Appendices - Select glossary of useful environment, tourism and marketing terms; Environmental regulations, market mechanisms and self-regulatory codes of conduct influencing the tourism industry; Select bibliography; Index.